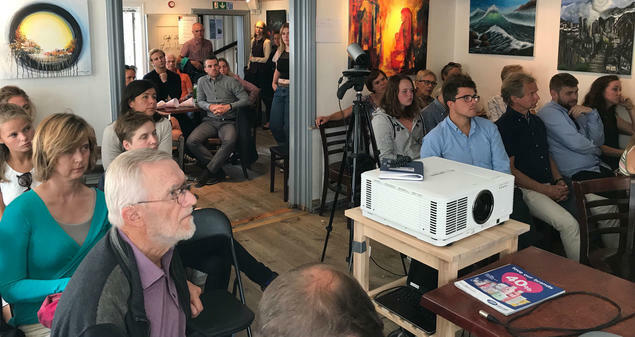 These and other questions were discussed at an open climate policy debate arranged jointly by the Fridtjof Nansen Institute (FNI), the research partnership CICEP and the popular foreign policy podcast Du Verden in connection with ‘Arendalsuka’ - a week-long forum staged every year in the historical coastal town of Arendal. Who can grasp the tiller and set the ship back on course now that the Trump administration is withdrawing from the Paris agreement and the global climate policy arena? FNI’s Research Professor Jon Birger Skjærseth reasoned that the EU could very well be that shining star that could take – or rather keep – a leading position. After all, as Skjærseth argued, the EU has already been in the lead for several years in the field of global climate diplomacy. The EU is the only big political actor internationally which over time has proved its ability to show such leadership. The EU was instrumental both in getting the Kyoto Protocol into place, and it was vital also in making sure the Paris agreement became as ambitious as politically possible. The EU has shown remarkable ‘staying power’ in international climate politics since the 1992 UN Climate Convention’, Skjærseth reminded his audience. ‘Second, the EU has actually delivered concrete results in terms of cutting climate gas emissions – unlike many others. It has cut emissions by more than 20 per cent since 1990, and doubled the use of renewable energy in the past decade. These results are partly related to an active climate and energy policy. Last, but not least, the EU continues to set ambitious goals; it has pledged to cut emissions by at least 40 per cent by 2030 and 80 per cent by 2050 compared to 1990 levels. Taken together, these factors suggest that the EU is both able and willing to continue its leadership role and help implement the Paris Agreement in the years to come’, Skjærseth concluded. Having said that, there are forces pulling in the opposite direction, Skjærseth said, most notably anchored in the deep internal energy-economic divisions within the EU. Pressing issues such as Brexit, economic problems and immigration, could very well absorb much needed political capital and remove necessary focus from the climate agenda. 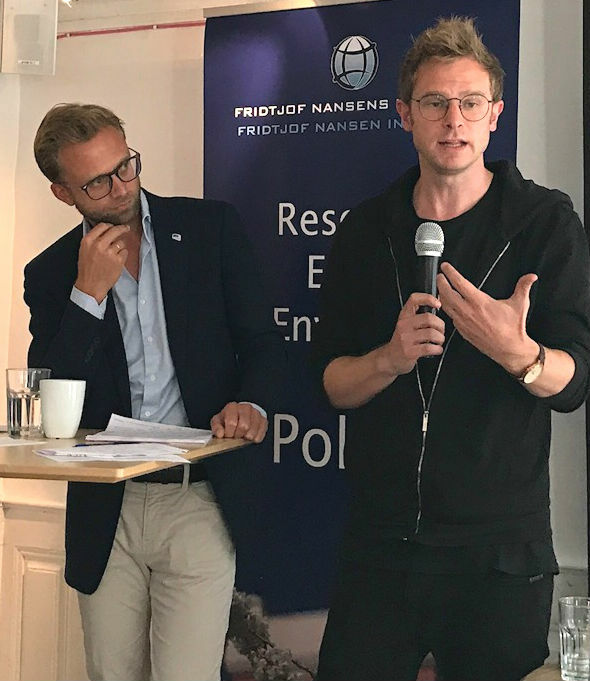 FNI’s senior researcher and China expert Dr. Gørild Heggelund pointed to a series of arguments suggesting that China could become the ‘agenda-setter’ in international climate politics. Heggelund highlighted several positive trends, such as China’s significant coal consumption reduction and large renewable energy investments in the past few years, and not least the fact that China is about to launch the world’s biggest carbon trading market this year. China’s climate change policies must also be seen in light of the country’s foreign policy, Heggelund stressed; China has taken a more assertive role in global affairs in recent years, as at the meeting of the G20 where China has promoted Green Finance and the 2030 Agenda (the Sustainable Development Goals). An increased leadership role could also be in the interest of China itself, not least considering the damaging local pollution and public health consequences of its climate gas emissions. And with Trump leaving the global climate stage, China could very well seize the opportunity and take on greater responsibilities. But the question is: does it want this role? 'There are different views on this in China, on what a leadership role on climate change would mean for the country. There is political will to address energy and climate change issues, but energy restructuring will take some time’, Heggelund said. There are substantial economic and social dimensions related to China’s green revolution, with some 6 million people currently working in the coal industry. It will be no small task to ensure a ‘smooth transition’ for such a large work force, Heggelund concluded. So who’s Norway rooting for? Politicians running for election in the autumn were also represented on the panel. Which ‘climate leader’ would they prefer from a purely Norwegian point of view: Brussels or Beijing? ‘No doubt, it feels more familiar and “comfortable” relying on the EU as a global leader in climate politics, rather than relying on China,’ said climate policy spokesperson from the Socialist Left Party, Snorre Valen. He pointed to China’s problems with corruption, its authoritarian rule and non-democratic political system. 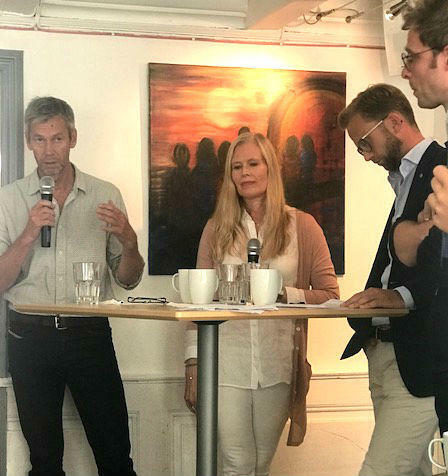 Nikolai Astrup, climate policy spokesperson from the Conservative Party, argued, on the other hand, that Norway should continue to align its climate policy as closely as possible to the EU. ‘The EU has been, and probably will remain, a ‘leading star’ when it comes to setting ambitious climate policy goals. So aligning our policies with EU’s helps ensure ambitious policies also in Norway. However, this does not mean that we shouldn’t also cooperate closer with China on climate issues. The one doesn’t rule out the other,’ he argued. Du Verden will be publishing a separate podcast of highlights of the debate shortly. A link will be posted on this site as soon as the podcast is available.